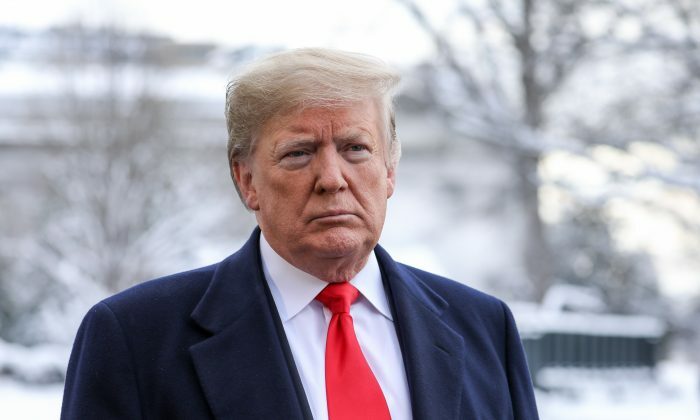 WASHINGTON—President Donald Trump sent a letter to Speaker of the House Nancy Pelosi (D-Calif.) on Jan. 17, telling her that her upcoming “seven-day excursion” to Brussels, Egypt, and Afghanistan has been postponed until after the government shutdown is over. According to various online videos and reports, Pelosi and her contingent were heading to the airport for takeoff when the letter was issued. Trump’s letter comes a day after Pelosi suggested the president delay his State of the Union address, set for Jan. 29, until the shutdown is over. Pelosi also suggested Secret Service would be unable to provide adequate security if the State of the Union were to be held while the shutdown continued. As Commander-in-Chief, Trump can ground any Department of Defense aircraft, which is how Pelosi had been planning to fly. “Obviously, if you would like to make your journey by flying commercial, that would certainly be your prerogative,” Trump said. At a press conference earlier on Jan. 17, Pelosi was asked what she would do if the government shutdown was ongoing and Trump wanted to stick to the Jan. 29 State of the Union. “We’ll cross that bridge when we come to it,” she responded. Democrats have refused to appropriate the $5.7 billion in border wall funding that Trump is asking for, saying more fencing along the border would be expensive and ineffective. In fiscal 2018, almost 400,000 people were apprehended by Border Patrol after crossing the southwest border illegally.